She also added some Stickles for sparkle and black thread for the antennae. 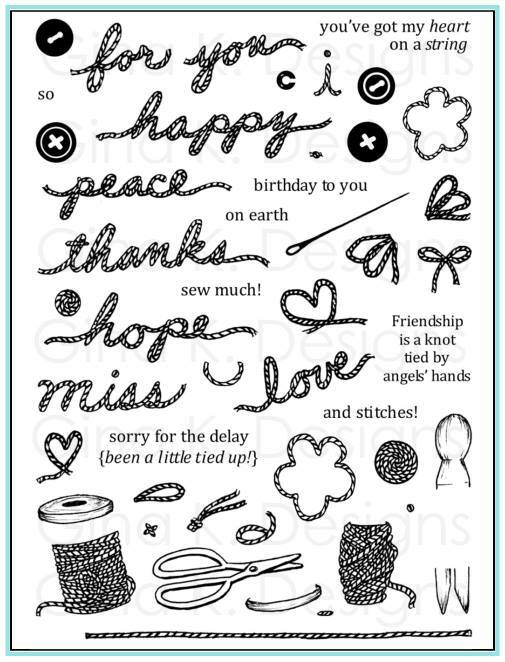 I love the idea of using thread BTW, adds some fun texture and will hold up better than thin, fussy cut stamped on paper antennae! Thanks, Libby for the inspiration and sharing this fun looking technique, I think it's just perfect to go with the butterfly wings! :) More fun with "Make a Statement" and Libby coming up! PS If you already know or have stumbled across the big secret, you can just leave a comment saying "I know!" or "WINK!" (because I'm curious to know who all knows) but PLEASE please PLEASE let me be the one to tell everyone else, okay?? You only have one more day to hold it in, and if I can wait you can!!! Inspiration Hop Day 1: "Stately Flowers 2" and "Mountain Wilderness"
Good morning! Hope you all had time to come by the release party last night! Welcome to our first day of Inspiration Hops with the Gina K team! Today we are showcasing two sets. The first, "Stately Flowers 2", is the second in my new "Stately Flowers" series, featuring state flowers from all 50 states. This month, I'm bringing you flowers from four more states: Goldenrod (Nebraska, Kentucky), Camellia (Alabama) and Hawthorn (Missouri). Today I decided to go more bright and whimsical with the flowers, to demonstrate that just because they are so are detailed, these images don't always have to go elegant/vintage! TIP: I also changed it up a bit by stamping them in gray, it's a little more subtle and looks more like a pencil drawing. Then I created different levels of pop dots, one for the leaves, stacked pop dots "two high" for the middle section, and then used none for the third, and you really get an interesting dimensional effect! While I was coloring these, (Missouri's flower is the White Hawthorn, although they come in a variety of shades), with the rosy and green round centers and pink tipped stamens I noticed how it cute it would be with this fun polka dot DP that's included in the new StampTV kit! So from there, I needed to die cut some circles for my backdrop and sentiment (lots of pretty ones in this set in for a variety of occasions), then adhere round Pure Luxury buttons to match the DP and image. Next up, we have Theresa Momber's "Mountain Wilderness" set. I LOVE all the new animals she included, which will work so well with all the gorgeous backdrop images from all her previous realistic outdoor sets! I had to start with this lone wolf and do a very simple but effective technique I enjoy with silhouettes. I'll show you how easy it is to put him on a mountain top without coloring or drawing. First I stamped the wolf in black on white CS, and then stamped again on scratch paper. Cut out the area from the scratch piece underneath where he's standing at angle, uneven, to make the top of the mountain. TIP: You can pencil a line, but I just free-cut, you don't want it to be perfectly symmetrical or it won't look realistic. Die cut a circle from scratch paper to place over the vertical greeting (don't you love these new long greetings?!) so it just fits around the "Thinking", and sponged Fired Brick and Tattered Rose Distressing Inks all around the circle to create a sunset. Now please go have fun hopping with the rest of our team! 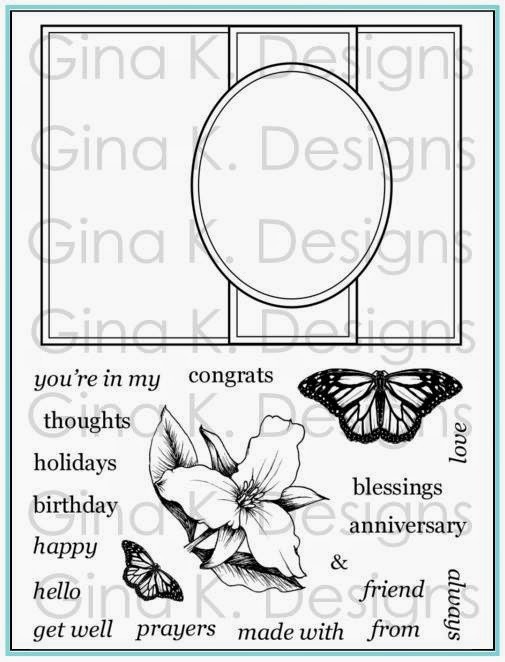 Be sure to leave comments along the way to give you more chances to win a grab bag of stamps from Gina K Designs! Thank you for visiting today! I appreciate your comments! Have a terrific weekend! You're Invited: GKD Release Party Tonight! 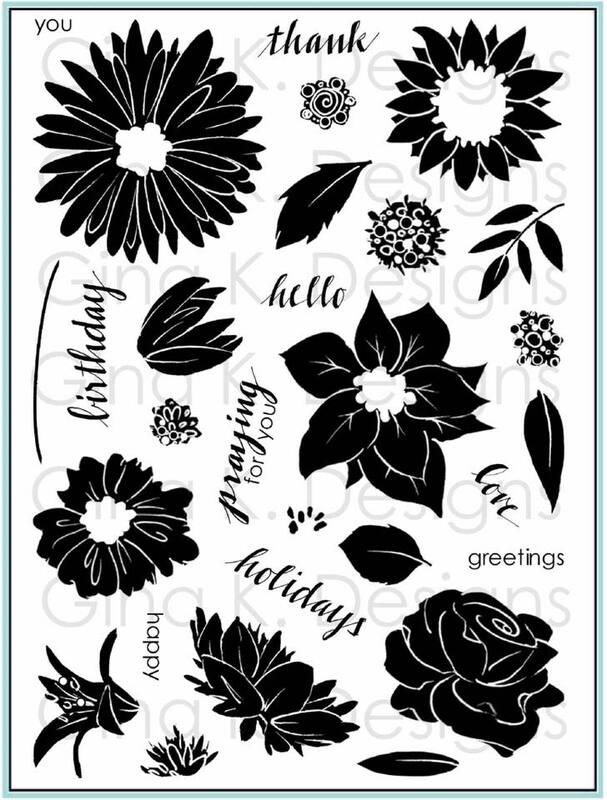 We are very excited to extend an invitation to Gina K. Designs December Release Party! We have a fun evening planned for you - chatting, prizes, challenges, stamp sets reveal, design team shares, and most importantly, at the end of the party you will be able to start shopping at 7 PM! If you came from Michelle Woerner's blog, you're at the right place. If not make sure to head over to StampTV where you will find a list of all those participating in today's hop. 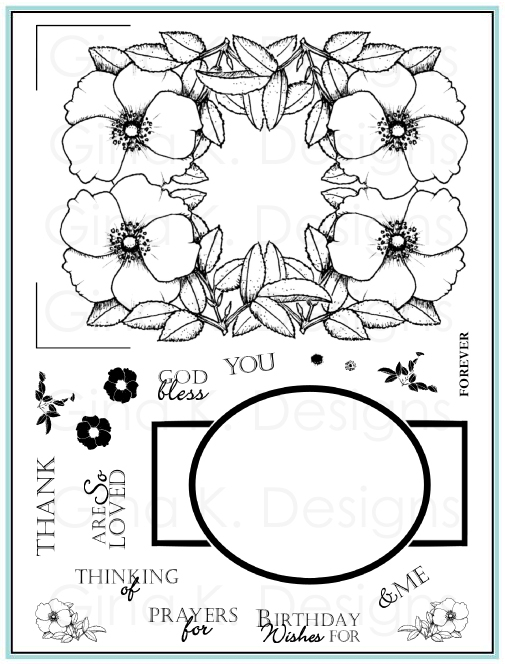 Here's a peek of one of the cards I will be sharing at the party, using my new "Stately Flowers 2" * set (plus a greeting for Theresa's new "Mountain Wilderness"! Both sets will be revealed tonight showcased during our Friday Inspiration Hop) Tutorial for this card will follow on my blog. Head on over to Lee Murphy's blog to see what she's sharing with you today, and see you back here on tomorrow for the beginning of our three day Inspiration Blog Hop series for December! Your flowers are all gorgeous. I've lived all my life in Missouri, so I'm hoping the sneak peak was a Hawthorn. Congratulations Judy! Please contact me ASAP with your snail addy so I can get the set out to you! Everyone else, I hope you will join us at the release party tomorrow night for the full reveal of the set and see all the new flowers and states included, along with of course all our other fabulous new release products! Details about the party here tomorrow, and then our inspiration hops featuring the new sets begin on Friday, with this set up first! Okay, here's an easy one: tell me where you're from!! I have a new "Stately Flowers" set coming out this Thursday, and if you live in one of the states included in December's set, you just might be one of the first to get "Stately Flowers 2"! :) Let me know below! First, a little Christmas present I just bought myself I think a lot of you might be interested in, you can order it wherever you live: Zaggorra Hot Pants for only$26 (a $71 value) Now I had never heard of these workout shorts before this morning, but I had finished a sticky sweet and buttery serving of monkey bread (our Christmas breakfast, easy peasy) and came padding in my office to check my email and saw a deal for some miracle promising, fat and inch busting, cellulite reducing shorts. Well! I had to investigate, and I believe they must really do the trick after reading all the reviews from ecstatic ladies on the company's website and had to get a pair of my own! (Size chart is on the site, you select your size later after you get the voucher) As you know I have been dieting and working out, but even when I have been my thinnest in my adult life, I still had cellulite. The site explains you can wear them to bed, working out or under your normal clothes, but you will sweat a lot as it pulls out those toxins. When I receive them, I am going to try their 2 weeks challenge and record inches lost 9will of course comeback and report!) I didn't take any measurements when I started juicing, but have obviously lost a bunch based on how my clothes are fitting and pounds lost. Do you own a pair of these shorts or heard of them?? Let me know what you think! 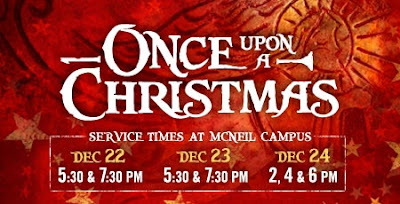 Next, a really cool Christmas as program "Once Upon a Christmas" I went to yesterday with my kids, it was FREE and produced and performed by Gateway Church here in Austin. I'm telling you about it because YOU can watch a streaming version of the full show on their site TODAY at 11 AM CST. If you have kids, tweens or just have time to check out part of it, I think you'll find it really entertaining! (If I didn't already have a home church this is one I would definitely be interested in attending. They really have a vision (was so impressed this massive church is only 13 years old and yet was able to put on such a professional looking production, doing so much outreach in the community around the world and having this gorgeous facility) This was a really dynamic pageant and fresh modern retelling of the Christmas story. It held my 6 and 9 year old boys' interest for the full 75 minutes, combining break dancing (Yeah, I know, sounds cheesy but was fun to watch! This was the angelic host proclaiming the good news to the shepherds!) plus a lot of pop music (teenage Mary receiving the amazing news about Jesus while "Unwritten" by Natasha Beddingfield blared, it actually worked! " Today is where you book begins, the rest is still unwritten..." or "Who Can it be Now?" from the innkeeper (by Men at Work! hee hee) The singers had really good voices, (as well as being very telegenic!) and the camera work for visuals were very good. I think the video will still be available on the site after 11 but I'm not sure about that. See what you think! A fun way to enjoy the Christmas story in a new way. * The lighting and solos and choruses often remind me of a PBS music special like Celtic Woman or Andrew Lloyd Webber staging. The traditional Christmas songs had hipper or country-pop crossover arrangements. Check it out at the link above, 11 CST! 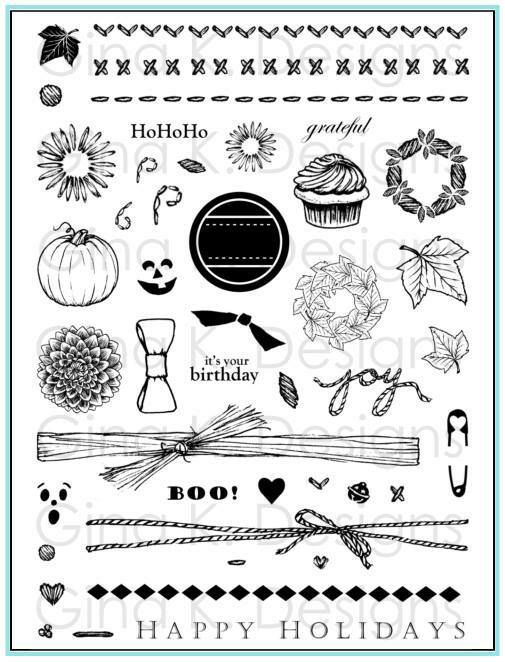 I'll be back with some blog candy (new stamps) a very important announcement, and our release is coming up on Thursday this week! Fun stuff!! We have been having such a great week with our family, more later, but in a nutshell had our first family ski trip (to New Mexico), tons of snow, a great time opening gifts this morning and watching home movies of Christmas past (I really did not remember my oldest son sounding like that at age 2 until watching! and it was so lonely without William running around with him (he was in my tummy that morning!) Will want to hear all about your Christmas celebrations, too! :) Your comments and support are gifts every day of the year! * The only thing that didn't sit well with me was Mary's very frightened and doubting reaction (which is what you'd expect and is relatable if this happened to a teenage girl today! 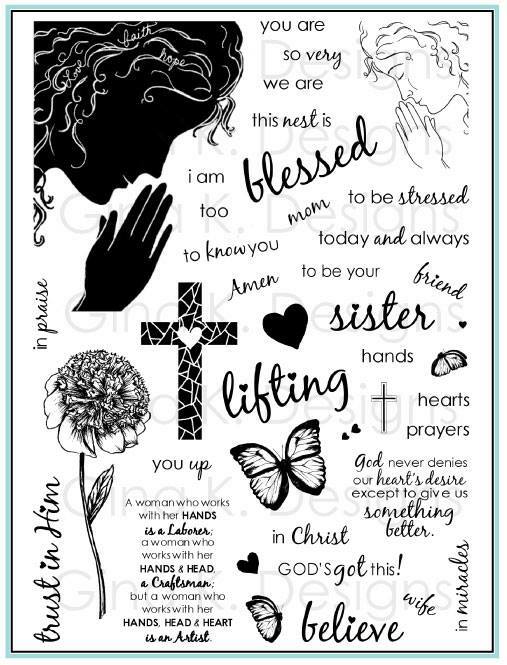 ), but I just kept remembering the reaction the Bible conveyed instead in scripture, her very accepting and humble "May it be as you say" from the Magnificat. Otherwise, two thumbs up! 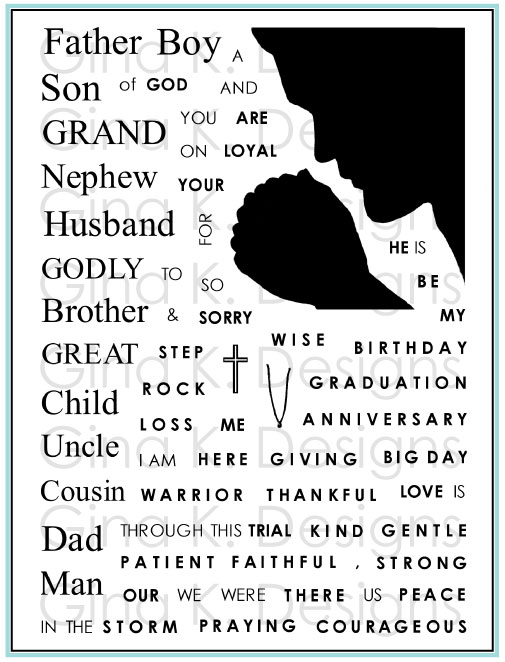 Dies are a must have for creating gorgeous windows for your favorite images! There's just something magical about an opening on a card to a beautiful scene inside, like peering into another world! Today Karen kept it very clean and simple on this "Stately Flowers 1" sample with a white base, white is always perfect with blue, feels so fresh and crisp. The fussy cut dimensional flower makes it extra special! Thank you Karen for sharing your designs with us this month! (Card details here) What a blessing when I am busier than usual, this time I have been able to spend with family and take a short break from work is so precious! I hope you are all enjoying yourselves and loved ones as we head even closer to the holidays! How excited do you think I was to round the corner of the historic Burnet, TX town square and see these larger life sculptures of our state flower? 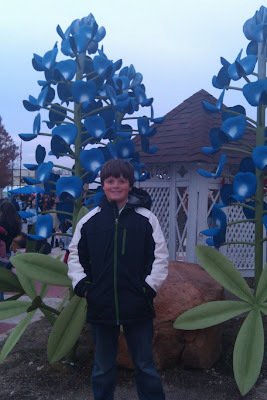 (How perfect for sharing some bluebonnet inspiration this month on the blog!) Here is Jonathan standing in front of them. If you live in Central Texas, I highly recommend planning a trip to Burnet next year for their Christmas festival and Main Street Bethlehem event. First Baptist Church in Burnet hosts not only a living nativity but has built a replica of Bethlehem ( has been going on for almost 20 years this is a permanent addition) with hundreds of costumed adults, children and animals inside creating the night of Jesus' birth in amazing detail! I have been wanting to go since I heard about it a few years ago, but this was the first time we were able to make it, they only have it the first two weekend in December. It was like being on the set of the movie , with the 1st century architecture I don't think you could experience anything like. the town is complete with a tavern, inn, jail, homes, carpenter, leather, rope making shops, weavers, a market, churner, temple etc. Passing by the holy family at the end, the one quiet place in the busy town, gave me a serious lump in my throat, it was VERY moving. Cameras were not allowed to keep the experience as authentic as possible. There are a few photos on the website but they do NOT do it justice as it doesn't start until 6, so the town is completely dark expect for candlelight and torches outside the buildings. The people interacted with one another but would speak to you if you asked questions, staying in character. Having said all that, it IS over until next year, but I think your family would love it, mark your calendars to put this on your holiday traditions list if you can! The second Saturday of the month they have a large arts and crafts festival with food, kids activities and a parade which is fun thing to do before going to Bethlehem! Just this season, I noticed several other small towns around Austin trying to follow their example and recreate a main street Bethlehem experience, but I don't think you will find anything quite like this! Do you have something like this where you live? I would love to hear about it! Good morning! I hope you had a wonderful weekend! Today we have another "Stately Flowers 1" card from Karen, is this beautiful golden yellow gorgeous with the red or what? Red poppies are my fave! More dies I must have, look what an interesting and eye-catching design layering just two of these on the base created! I also love how the large red polka dots suggest the round flowers in a whimsical subtle way! Makes the very detailed line art makes it feel very fresh and modern! TIP: If you don't want to use the California as part of your label for the flower, just use a marker to omit the state and only ink up "Poppy". Thank for another gorgeous creation Karen! Please go check out her blog for a complete list of materials to recreate this project! Coming soon: some inspiration from another special guest using the "Make a State-ment" set! Can't wait! A Special for You...Don't Miss! Now that you are probably close to finishing up your/holiday winter cards (maybe? nope?? LOL), you might be starting to think about Spring! 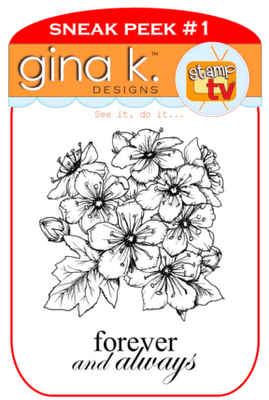 :) One more day to take advantage of this fabulous "three-fer" Gina K Designs special, some really fun floral and greeting sets! Choose any three for only $39, offer ends tonight! and then I burst out laughing when I flipped it over! Thank you, good friends, for remembering me! Today I am honored to be able to share some "Stately Flowers" inspiration from my talented friend Karen Knegten! Karen's cards always "Wow!" me in the STV gallery, I can spot her work before I even read her name! Next week she has samples with the other flowers too, but we're starting off with this beautifully colored violet...Did you know Karen lives in Wisconsin? 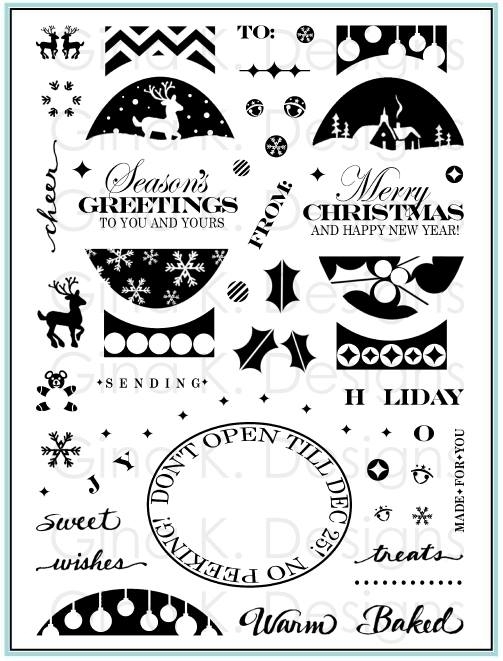 That label die she stamped the flowers on and lattice rectangle underneath just moved to the top of my wishlist, how about you? 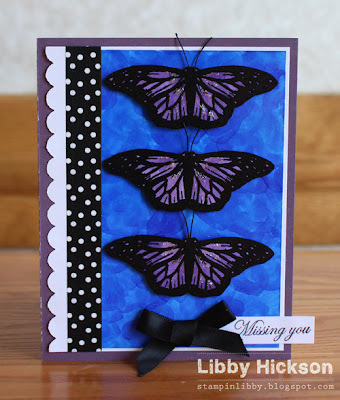 ;) Now please go check out her blog for a complete list of materials to make this beautiful card! Good morning! Just wanted to give you a little update about how my juicing and workout regimen is going: in exactly 2 months, I've lost 16 pounds substituting fresh vegetable and fruit juices for meals 1-2 times a day! I've also been working out for an hour (step classes and strength training) 3-4 times a week. I did get one comment from a reader who said they got sick from juicing, but I just can't say enough good things about it! (You can read more about how I got started juicing here) I have so much energy, am getting compliments on how great my skin looks, and two of my friends went out and bought juicers (with a third and fourth considering it!) seeing how well it is working for me! A measure of how my health is beyond how I look and feel, I was able to donate blood the week before Thanksgiving! This is the first time my iron was high enough to donate since May, (I tried several times over the summer) and yippee, this time I was good to go! Afterwards you get your cholesterol count and get this, my cholesterol went from 215 (moderately high) to 166 (great!!) A difference of 49 points! I don't have any measure of what it was right before I started juicing since I couldn't donate over the summer months, but I suspect it was even *higher* than in May, as my kids and I hit the ice cream all summer pretty hard, hence my need to say "enough!" I wanted to also tell you about something I learned from a book called "Juicing for Life" which lists all types of conditions and the vitamin deficiencies associated with them, it tells you what fruits and vegetable are rich for each and good supplements to overcome these conditions. Remember how I said I used to have a big sweet (chocolate) tooth but now I don't? The book explained sugar and chocolate cravings are triggered by a lack of chromium, a substance used to break down sugars. The more you eat, the more you use, and unfortunately , a lack of chromium results in more cravings. The recommended foods that are high in chromium are spinach, carrots and apples, and by golly, if I'm not eating those every day now! I can totally feel a difference, ti's not me having the willpower to pass up the chocolate or the wisdom, but just that it has really lost its appeal. Now back to the cholesterol: I've also given up dairy. Now, I did have some cheese in a breakfast casserole over the holidays and have had a piece of pizza, so I'm not going to say "never", but I drink almond milk (unsweetened vanilla, grocery brand in the dairy aisle) and coconut milk (original)now, and I LOVE them! Especially the coconut milk, it is so thick and creamy, like having a coconut milk shake! I'll have a cup of that now as a snack or my dessert. Did you know that coconut milk has NO cholesterol, less fat, less calories and MORE calcium than cow milk? I'm not knocking cow milk, but I will say I seem to have more trouble digesting it than I used to, and I am really enjoying these new flavors, so it's working for me! Anyway, I am fast and furiously preparing for the holidays, stamping is barely even on the radar with the shopping and baking, etc! I did have a super cute and pretty simple Christmas card idea using the "Stately Flowers 1" set, so I hope to be back share that with you shortly! Hope you are doing well and enjoying December! BTW, I have some HUGE news to share very soon!!!! Tease tease! Here is a simple design I made for a friend in California, using the poppy from "Stately Flowers 1". (Incidentally, I would send this to someone in another state just as well even with the California on it, LOL! * I just love the names of things in a design) I just love Pure Luxury Wild Dandelion together with White and Black Onyx! After coloring my poppy with Copics, I used BV31 Pale Lavender to go all around the flower in circles like muted watercoloring and I really like how it turned out! (Purple, complimentary color to yellow, even as light as this, really makes your yellows pop and glow.) I planned to do a coloring tutorial for this one, but I forgot to take photos of a couple of the steps, so I will redo for you! These colors are Y06, Y17, YR68, G12 and G24. The reason for the triangle in the sketch, I had a scrap I needed to use! It gives the design a lot more interest and energy, though (perhaps suggests a mountain, too?? dunno) I added a teeny bit of black bling and stamped the poppy again in Versamark peeking out under the mat, love this watermarked detail! Card also uses Pure Luxury Grass Green. Hope your week is off to a terrific start! *But I do know lots of peeps in CA!! Good morning! Hope you all had a terrific weekend! We put up our Christmas tree and visited a really cute downtown market square Christmas festival in Georgetown. Today I am sharing a card that I made for a friend of mine in Wisconsin using the Wood Violet from "Stately Flowers 1". papers are Pure Luxury Wild Heather, Black Onyx and White. I colored the image with Copics, violets range from so many blues to purples to even magentas so there are tons of coloring possibilities and patterned papers and cardstock that will coordinate. Here I used some more periwinkle shades and a W-3 for shadows. To make the background, I stamped the smaller violets in Milled Lavender all over a piece of Gina patterned paper (love this ivory print with a very subtle harlequin diamond and brocade overlays) for perfect coordination. 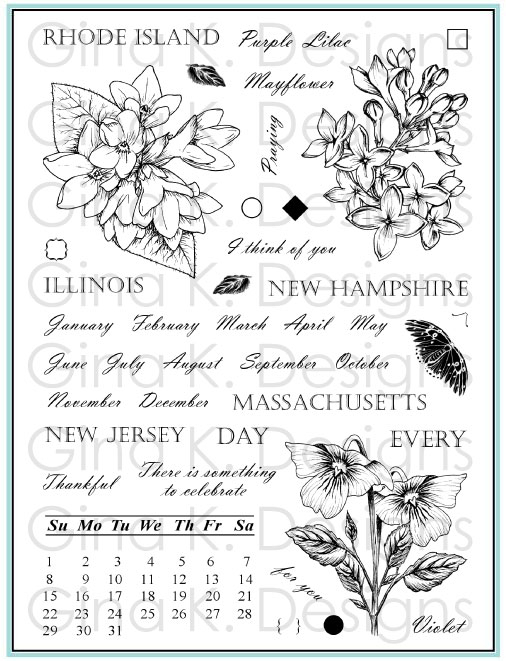 I included smaller versions of two of the state flowers in this set which lend themselves really well to making borders, stamping the inside or back of your card, decorating you envelopes, or custom patterned papers like these. TIP: Turn the image each time you stamp so your pattern doesn't look too static and the different parts of the flowers and leaves "nest" into the surrounding ones. Here you can see a closeup of the coloring and how I used the line with the diamonds element in the set to accent the state and flower name. You could also do the names in one color in and the line in black or another color to really make it pop. I just love the name of things and adding the flower's name with the image like a botanical print! I used a few little adhesive pearls, a white doily, and a Fancy Tag 3 I die cut from Black Onyx and then snipped in half so that I could separate the pieces and have them cascade around the corners, you don't see the cut behind the doily. Black Onyx mat is cut with a Classic Petal Edgebilities. Next, I stamped in out three more times on another piece with Faded Jeans, Fired Brick and Crushed Olive Distressing Inks, then punched a 1 1/4" square out of the center of each. I popped each of these up over the blocks on the strop lining up the images. I mounted the strip on Soft Sand and then a scrap of Basic Grey Curio, and adhering it all to the Pure Luxury White base. Sentiment is also stamped in Fired Brick, I put that red block at the top to balance out the greeting at the bottom. Next we have this "Master Butterfly" duo. I love this quote and actually have this same sentiment one of my sets, but this font is so different: here, instead of a sympathy greeting, this end of the world quote is more whimsical, and I thought would be really appropriate for those daily life disappointments that seem like the end of the world in the moment but just days later (or even later that day!) are really no big deal, know what I mean? So I wanted this card of encouragement to have some seriously happy colors: Passionate Pink, Key Lime, Blue Raspberry and Sweet Mango. 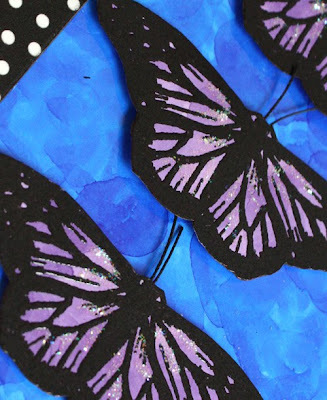 I created a color block by stamping the butterfly in the center of these three different scraps of paper, cutting them into thirds and then piecing them together, leaving division in between. Next I used the unused pieces to cut out the three separate parts of the body and create a reverse effect, gluing them over the contrasting colors. So it's a little spotlighting little split negative, little pop art! I like how this conveys the change and growth. (I have actually been doing a terrific Bible study this semester called Jonah: A Life Interrupted by Priscilla Shirer, the main theme of the study is that is that life's interruptions are really divine interventions and if we allow them to be, amazing opportunities, I highly recommend it!) Finally I applied a layer of Crystal Stickles over each. Base is Black Onyx. Our last duo is this adorable "Just Calling to Say", the kind of retro style and shape of the phone had me reaching for this cute Echo Park Holly Jolly Christmas number patterned paper, numbered backgrounds are always fun for birthdays (although, ahem! all my friends are older than 25 now lol!) and this one for a Christmas birthday especially! I stamped the phone in black first and then stamped it again in red to cut out and pop up over the first. I used some tiny adhesive rhinestone on every other number in the dial and free-cut my own word bubble out of Grass Green cardstock for the sentiment to come blasting through the phone! :) Heart cut with a Cuttlebug die from Lipstick Red Pure Luxury, base is Chocolate Brown. I also used a small corner rounder punch and Classic Circle Nestabilites. Thanks very much for visiting today! 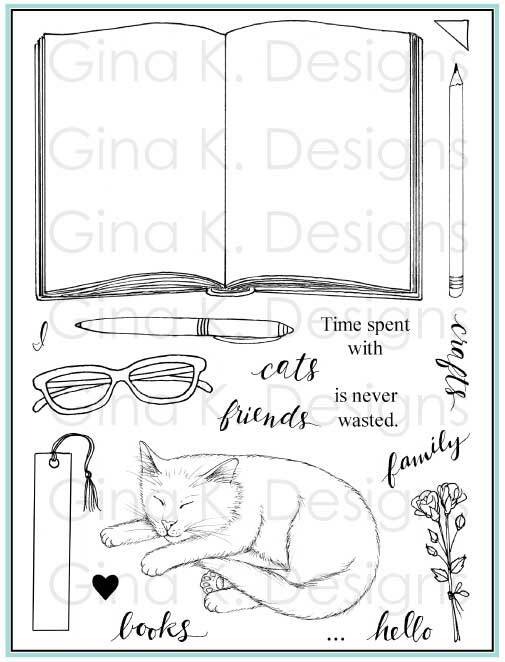 Be sure to leave lots of comments along the way, you could win a grab bag of 12 stamp images from Gina K Designs, the more you leave, the better your chances of winning! I hope you have a great weekend! We'll be putting up our tree, decorating the house and lots of other fun festive stuff! See you next week! 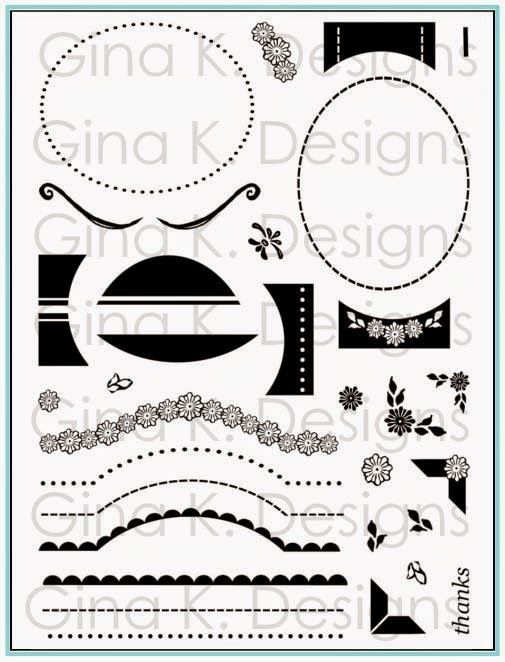 Welcome back to our November Inspiration Hop with the newest sets from Gina K Designs! First up we have this beautiful set "Dogwood and Butterfly" from Theresa Momber. I love this frame, already embellished with a garland of dogwoods and a space to add your greeting! I stamped it on white and colored with Copics. I referenced some pics I found online with just a hint of peach on the tips to color them, this Basic Grey Curio was perfect to go with! They have really deep veins and grooves in the petals, so I added stripes of gray for shadows. Last I sponged with some Frayed Burlap Distressing Ink, traced here and there with a stardust pen and adhered it behind this popped up Grass Green window cut from a Classic Oval and a Beaded Oval Nestabilities. Card also uses Cuttlebug "Grace's Frame" embossing folder and adhesive pearls, and Ivory and Chocolate Brown for the base and layering. After stamping each on different Pure Luxury Cardstocks (Bubblegum Pink, Moonlit Fog, and Key Lime) and cutting them out, stamped them again on white to make the faces from the label part and drew on some simple numbers and hands with Memento markers to show different times during the day ("GREAT day!" all day! ) to go with the greeting. I added a little bling with some adhesive rhinestones and a silver nail head. I stamped "great" on pink and popped it up to make that corner a little more interesting. :) Base is Black Onyx. Last we have another duo: "Friends are Flowers". I colored this image with Copics (R05, R22, G12 , YG97, and W3 for shadows) but instead of stamping on white I used a piece of green DP from Basic Gray Curio pack to change it up! I cut it with a Labels 14 Nestabilities and sponged on just a little Frayed Burlap before removing the die. I placed this over a Beaded Oval Nestabilites cut from Chocolate Brown. Patterned paper is also from the Curio pack, a perfect match for this image! The greeting is stamped on a Fancy Tags 2 and attached with mini brads. Base is Pure Luxury White. I love the contrast of the bright white with all these distressed elements! Thanks very much for visiting today, and please come back tomorrow for our final Inspiration Hop this month! 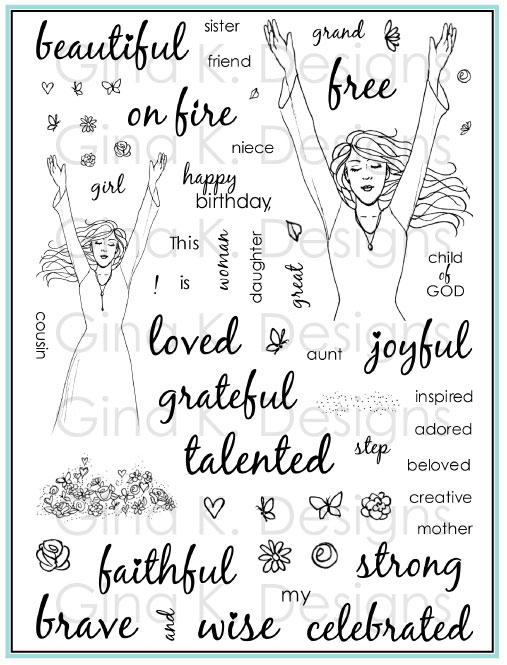 Be sure to leave lots of comments along the way, you could win a grab bag of 12 stamp images from Gina K Designs, the more you leave, the better your chances of winning! Thank you for visiting! Wishing you a great day!